Do you worry about endangered animals? If you don’t you should start to. Most people don’t mean to catch Vaquitas. When they are fishing they use big nets and sometimes they accidentally catch the Vaquitas along with the fish and they don’t let them go. It is a threat to sea life. Vaquitas are very important to their habitat. Vaquitas are found on the California Gulf. Vaquitas are in trouble. Animals such as sharks go to their homes and eat their babies. They started to swim in shallows in 1995. Vaquitas are endangered and we need to help. Vaquitas have very black lips. They also have a big diet of fish. Their eyes are encircled with black rings. 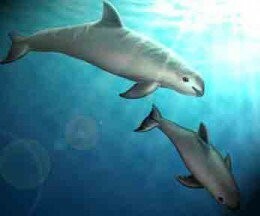 One more thing is that Vaquitas have a blunt body and a blocky head. The Vaquita is endangered. Can you help save it? Vaquitas get nervous around boats. They only jump when going away. They either travel in groups of two or ten for safety. Without a doubt, Vaquitas are important to their species. I definitely think the we need to take action now to save this species. We do not want this species to go extinct. Imagine if you were a dolphin and you were going extinct you would want to be saved. We can make a change to the ocean if not the world. We will save the Vaquita.